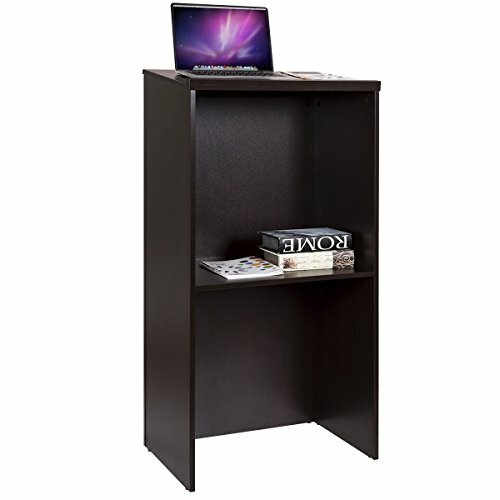 Tangkula wood lectern comes with sturdy construction and classic design. Slanted table top, pencil slot, storage shelf, all these humanization design makes it perfect formany places, meeting, speech, lecture, religious. There are 2 colors, darkbrown and natural wood. One can be used for some solemn occasion, and another one is more proper in classrooms. And there is storage shelf for placing dailyitems, cups, papers, equipment or brochures. This lectern will be your good company. Welcome to buy one! 【Sturdy & Durable】The lectern is made of 15mm chipboard. Chipboard has some advantages: weight capacity is larger. And the material is environment friendly, long-lasting. This lectern can be used for years like new. 【Storage Space & Adjustable Shelf】There is a handy place to store your papers, equipments, cases or daily items that you may use them through your class. 【Multifunction Podium】With classic and elegant look this lectern can be used in many places, meeting halls, classrooms, conference rooms. Even for religious activities, or restaurants to keep reservations and waiting lists handy. 【Humanization Design & Convenient】Slanted and spacious table top is perfect for a speech. The angle of the slanted top is suitable for sight. And there is 0.6" thick pencil slot. With it you can put your pencil, ruler or other tools and don't worry about falling down. If you have any questions about this product by Tangkula, contact us by completing and submitting the form below. If you are looking for a specif part number, please include it with your message. Mount-It! Mobile Stand Up Desk, Portable Podium and Presentation Lectern Height-Adjustable Multi-Purpose Standing Workstation,Black.